6) A thigmotactic (opposition) reflex. We recommend addressing general excitability, under-stimulation, stimulus arousal, and dominance causations via behavior modification programs that include proactive stimulation, dog day care, nutrition adjustment, impulse control training, leadership training, environmental modification, cognitive behavioral drills, counterconditioning/desensitization drills, management restrictions, and/or anti-anxiety medication. We recommend addressing causations involving lack of knowledge on the part of the owner or dog and/or tight-leash prompted thigmotactic reflex reactions by instituting leash walking procedures that provide consistently correct mechanics and communication. When teaching proper leash walking behavior, insist that your dog remain in heel position, with his right shoulder alongside your left leg. Keep your leash loose and praise appropriately for the correct behavior. To assist your objectives, lure him with food and reward him when he looks upward attentively. In many cases you may need to also incorporate mild leash response blocking techniques. In more refractory cases, you will need to properly select and fit an appropriate training collar and switch to a leather leash. 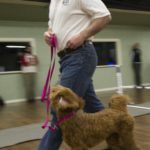 Usually, pinch collars and Gentle Leaders are the most effective collar choices when teaching loose-leash walking. However, some dogs may need the third option, a no-pull harness. In addition, start in a quiet, low-distraction location absent of other people and dogs, then progress to more challenging higher distraction environments only after your dog is confident and routinely successful in the easier locales.